then you will see an updated toolbar, with a few extra icons you may not have seen before. @SinisterSoft 3000 lines in main.lua ??? Dude, you have to start using OOP! No, I easily find my way around a program I've made with over 100k lines (not other peoples code though). If this isn't normal then maybe it's some advantage to having Aphantasia? 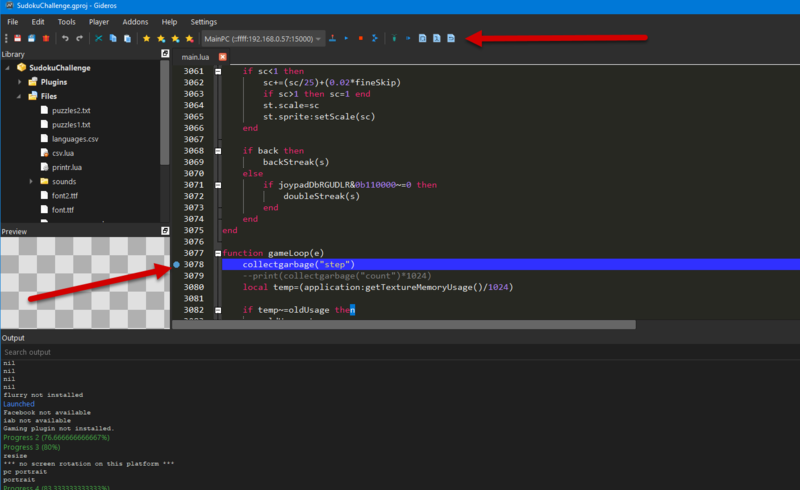 Btw, all of the new debugger stuff is work @hgy29 has been doing tirelessly to make Gideros much better for everyone, especially for beginners or those who need debug functions. If you want to encourage him to add more then I'm sure some donations would be appreciated, at least to buy him a drink! About the feedback - does everyone like the new look of the icons? Here is a couple of screenshots of the code running on a fire tablet with the code being stepped though in the Studio - you can even see what the value of a variable is that is on the tablet! then i assume you became smarter since last time. Thatbwould be cool @antix. Is there a good library to base it on? There are heaps if ready to go C implementations out there that just need to be made into a plugin for it to be up and running I think. @antix : I'll make a pathfinder plugin if there are no other takers. It could be a good one to heavily comment and make the basis of a tutorial too. Very very cool, with the debugging when a breakpoint is hit as well as hovering over variables is possible to execute code like in an 'immediate' mode? Hope I'm making sense! Did I see some autocompletion improvements as well in github, maybe I was dreaming lol? Sorry, tables aren’t supported yet, nor executing lua code. Tables are actually available internally to the studio, but It seemed impractical to display them in a tooltip. This will be added later, with call stack navigation, watch expression pane and immediate lua execution. @appymedia Thanks, that's what we like to hear. I guess 'Android App Bundle' support is on the way somewhere? Not for 2018.10, but probably for 2018.11! I guess even now we can export Gideros project to Android Studio. And then from Android Studio to App Bundle. Did somebody try it already? Or some other manipulations will be needed?